Kettle moraine is one of the best scenic drives I ever had. There are two ways of this drive you can go either north to south or south to north. As I live in southern Wisconsin, we decided to go the farthest point first so we went to Start point of north to south drive. I would advise you to Download direction instructions PDF from this link. Kettle moraine scenic drive . The reason why to keep a print out because if you miss any turn you will get away from the scenic drive. So better to be prepared I lost my path twice, but thank god I had the direction instructions with me. Start point of north to south drive starts from outside of the Broughton Sheboygan Marsh Park, Tower and Wildlife Area. So we first went to check out the view from the tower. If you are planning to visit the Marsh tower, then get ready to climb stairs around 4 floors. So started our scenic drive after exploring Marsh tower. In this drive, you will see many small towns and forest areas. Within 3 miles you will reach to Elkhart lake town, which is famous for historic race circuits. After crossing this town, two other towns will be on the way Glenbeulah and Greenbush. In Greenbush, one of the left turn sign is missing so make sure you turn left from the Old Wade House. After crossing Greenbush you will enter forest area and beautiful fall colors. Both sides of the road covered with colorful trees. You will drive by the long lake recreational area follow by Dundee town and then New Prospect. 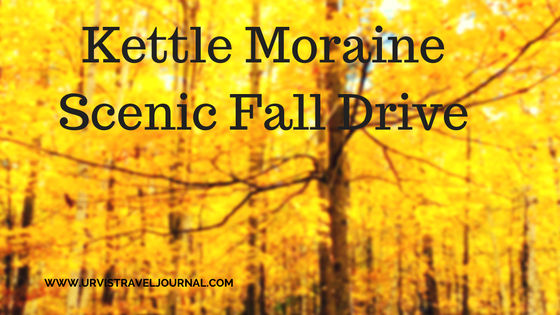 It also includes Kettle Moraine state park area in the drive. You will drive by Forest lake. You can stop by if you want, but we preferred to continue the drive. We decided to stop by at the Parnell tower to explore the top view of fall colors from 60 feet high tower. You need a state park parking permit or you can buy it on the spot. Further, we drove by the Kettle moraine forest area and crossed a smith lake, Big cedar lake, and Slinger town. Next is a pike lake Unit of the Kettle forest. The Pike lake is a great destination to explore fall colors through kayaking. We also cross by the holy hill. Holy Hill is known for The basilica of the national shrine of Mary. It has a scenic tower, which gives the great view. Also, you will encounter Monches recreation area and North lake town. Which leads to drive between Pine lake and Cornell lake. And followed by Moose lake and Okauchee lake. As we almost reached south side. We explore some of the new recreational area and small towns which hardly half an hour from our place. We didn’t know about Nashotah park. Next, we cross by Delafield town looks like a live and amazing town. There is also Nagawicka lake at Delafield so you can enjoy water activities as well. This drive was so fun and amazing views.